Double Exposures of Adelyn Chiang in Foster City, California and flowers from Claude Monet Giverny Garden in Giverny, France, July 2017. A collection of portraits from my daily assignments during the month of May 2017. Thank you Ross Taylor and the group of amazing photojournalist and experimental storytellers who spoke during the TID 2017 workshop in Denver Colorado. I received an abundance of knowledge, inspiration, portfolio critiques, but most importantly friendships. After having some reflective conversations with a few of this years' attendees we would like to provide some feedback and suggest topics to include in future workshops. 1) We appreciated the message and theme of "Find your way" but we desired to hear more about the failures and struggles of each photographers journey. It's crucial to talk about the triumphs and amazing stories each speaker has been privileged to document, yet it does not come without personal sacrifice and moments of fear and doubt. Lisa Krantz talked about her sacrifices to be present in her personal life and capture the story. 2) How to manage finances as a freelance photographer/videographer. 3) We appreciated Sophia Allison's voice and perspective as an experimental storyteller who realized that news photojournalism was not for her. Her vulnerability and "outside of the common mold" perspective was encouraging to hear since not everyone who attends the workshop feels news is a good fit for them. 4) Conversations and discussions about how the news industry is changing and the avenues for youth photojournalist to enter the field. 5) Best practices for self care since our job require deep investment in the people in our stories. 6) Inviting the local community of storytellers where the workshop is hosted to participate in the workshop in some way. We felt like we came to Denver for the workshop learned and talked about storytelling but did not get to experience the community of Denver and the local storyteller that are enacting change. 7) Difficulties being a staff photographer at an unstable newspaper organization. Mourners raise candles during a moment of silence at a vigil at Lake Merritt Pergola on Monday December 5, 2016. in honor of the 36 people who died in the Oakland Fire at the Ghost Ship warehouse party Friday, December 2. A women holds back tears at a vigil for the victims of the fatal warehouse fire during a vigil at Lake Merritt Pergola in Oakland, California, U.S. December 5, 2016. A woman holds flowers in honor of the 36 people who died in the Oakland Fire at the Ghost Ship warehouse party Friday, December 2. held at at Lake Merritt Pergola on Monday December 5, 2016. Mourners gather at a vigil for the victims of the fatal warehouse fire during a vigil at Lake Merritt Pergola in Oakland, California, U.S. December 5, 2016. A women places a candle at a memorial site in honor of the 36 people who died in the Oakland Fire at the Ghost Ship warehouse party Friday, December 2. Mourners embrace each other during a vigil for the victims of the fatal warehouse fire during a vigil at Lake Merritt Pergola in Oakland, California, U.S. December 5, 2016. Mourners embrace each other gather at a vigil for the victims of the fatal warehouse fire at a vigil at Lake Merritt Pergola in Oakland, California, U.S. December 5, 2016. A women cry after sharing about a friend who died in the fatal warehouse fire during a vigil at Lake Merritt Pergola in Oakland, California, U.S. December 5, 2016. A family shares stories of their son who was one of the 36 people who died in the Oakland Fire during a vigil at Lake Merritt Pergola in Oakland, California, U.S. December 5, 2016. Mourners gather at a vigil for the victims of the fatal warehouse fire during a vigil at at Lake Merritt Pergola in Oakland, California, U.S. December 5, 2016. 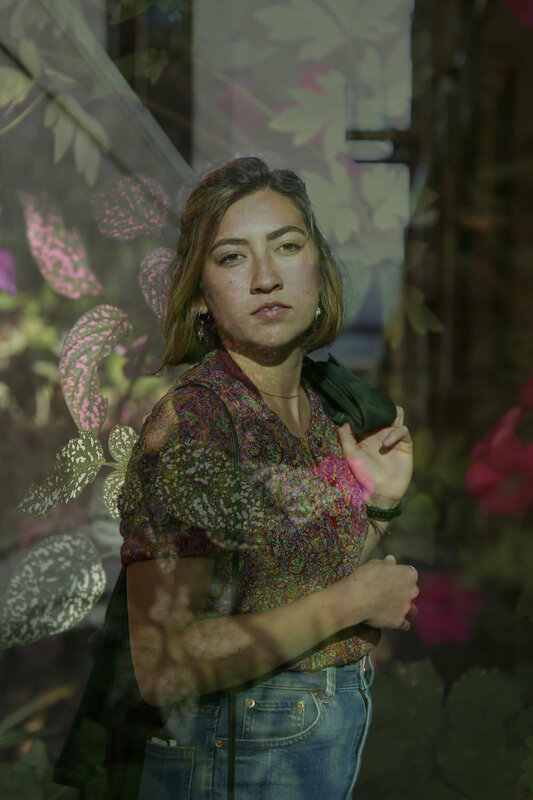 Portraits of Megan Tauber in the San Francisco Botanical Garden.